While gear, disc, and grid couplings have been hogging the spotlight for years, there have long existed two other well proven all metallic couplings that offer tremendous benefits in the medium and lower torque ranges. Those two couplings worthy of consideration are the three link (Deltaflex) and triple-wound spring (Uniflex), each of which is unique in the way it accommodates misalignment while carrying torque and connecting two machinery shafts. The Deltaflex is a mid-range torque coupling that can transmit up to 33,000 inch pounds (3,729 Nm) of torque, with bore capabilities from 7/16 inch to 5 inch (12 to 136 mm). It is a smooth power high misalignment coupling. The Uniflex could be considered the extension of mini couplings, and is a high misalignment, small profile, coupling suitable for up to 1,890 inch pounds (213.5 Nm) of torque. Bore range is 1/8 to 1-1/2 inches (3 to 38 mm). Both of the models are readily available from stock from Lovejoy and are available in stainless steel. The product catalog covers all the information necessary to complete the coupling selection, and both coupling types are generally purchased with little intervention required by sales or application engineers. All metal couplings are broadly categorized as infinite life (no wearing elements) or finite life (intentional wearing elements). The latter eventually wears out after a number of hours of service. Infinite life type of couplings include the Deltaflex and Uniflex (as well as the disc coupling), and use the bending or spring capabilities of metals. They can be designed for a load that does not exceed the fatigue life of the metal. As long as the load is below the fatigue limit the coupling will last indefinitely as there are no wearing parts. The fatigue limit can be exceeded in two ways. One way is for the cross section of the metal to change, as in a corrosive atmosphere, or if an unexpected external wear condition occurs. The other way is for a load to increase beyond the expected limit in stress or number of cycles. Transient or cyclic loads of unexpectedly large magnitude damage infinite life couplings more so than wear type couplings. Finite life couplings that wear out in time depend on the meshing of two surfaces to provide the misalignment and transfer the torque. The most popular example is the gear coupling. 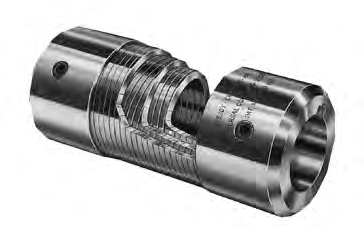 A jaw coupling and a sleeve or "S-Flex" also has two meshing surfaces that wear. The wear usually occurs in the teeth of the gear coupling or the elastomer of the jaw coupling. These are the parts that also provide the ability to handle misalignment. In the gear coupling and in the U-Joint, metal to metal contact, under lubrication, leads to wear that eventually destroys one of the parts. The jaw coupling wears at the interface of metal to elastomer. In the case of wearable couplings, the load carrying capability is a function of how long the coupling must last before wearing out. The misalignment is a function of the geometry or elasticity of the materials. Note: Controversy over the torque rating method can occurs in finite life (wear out) couplings. A manufacturer could publish high nominal torque on the presumption of short life, low misalignment or limited hours of service life. Lovejoy markets metal couplings of both the finite and infinite life type. Gear couplings as mentioned above and U-Joints fit the finite life category. Deltaflex and Uniflex couplings are infinite life couplings with limited load capability. The Deltaflex depends on metal links to transmit the torque while bending. The link can handle considerable distortion so the coupling has great misalignment capability. Uniflex couplings utilize a triple wound spring with lateral flexibility that again allows for great angular misalignment capability. All of the couplings mentioned here convert the angular misalignment capabilities to parallel misalignment by having a two flex plane system. Two flex planes or pivot points, each providing angular misalignment, allows the straight center section to span the radial displacement. Moving the angular flex points farther apart in the axial direction increases the ability to accommodate radial misalignment. It is a matter of geometry. To see this consider a triangle where the between shaft end ("BSE") dimension is one leg, the radial misalignment is the second leg and the center section of the coupling is the longest side of the triangle. The "BSE" or distance between the shafts on a horizontal plane is easy to determine and the coupling maximum angular capability is cataloged. With those two values one can determine the radial misalignment. We do not want the coupling to operate at that point. We just want the limit to be known. If more displacement is needed, a spacer coupling or floating shaft would be necessary to push the flex points farther apart. Axial misalignment, backlash and wind up are functions of the coupling configuration. These geometric movements are different for each type of coupling. The coupling capabilities reflect the differences. The Deltaflex and Uniflex have little capability for axial misalignment and in the case of the Deltaflex might even suffer failure if put in an application that has axial misalignment caused by a thrust load. The Uniflex would resist axial thrust at first and then would buckle which would constitute an unusual load. Keep in mind that infinite life couplings are infinite as long as they are not overloaded or subject to an unusual load. They may not fail instantly, but will fail prematurely or quickly. Backlash is looseness in the coupling that allows some sloppiness. The Deltaflex has no backlash and the Uniflex a little backlash. Gear couplings have backlash, U-Joints have backlash, and even the jaw coupling has backlash. The Uniflex has wind up. That means the coupling can twist under torsional load. In the case of the Uniflex coupling the windup is a known value that is directly proportional to the torque applied. Elastomeric couplings would windup in geometric proportion to the torque load until the elastomer is fully compressed. Once the coupling has wound up it can begin to transmit the motion. Backlash is similar in that the backlash gap must be closed before the motion transmittal can begin. Backlash usually gets larger as a coupling wears, whereas windup is a constant value. One is controlled one is not controlled. Backlash can also be a source of noise. The Uniflex coupling can be an expensive choice on the basis of bore capability. It is a little better on the basis of the torque carrying capability. Therefore, comparing the bore capability to the torque capability, in a series of coupling types, would show the Uniflex as a more durable coupling. That is it provides more torque carrying capability per inch of bore size than competitive types of coupling like the Lovejoy L line, S-Flex, Grid, Saga, and torsional couplings. That can help since it is one of the coupling types that are torque limiting. Torque limiting means that the shaft can deliver more torque than the coupling will be able to transfer. Uniflex couplings are generally very price competitive compared to the disc type, Saga, and torsional units. As a general rule of thumb, infinite life couplings cost more than wearable couplings with replaceable parts. That would make sense because the coupling never has to be replaced or rebuilt. Designers choose infinite life couplings when maintenance is expensive; the coupling is hidden in the machinery or when the main equipment is also in a non-wearing application. Designer’s use wear out couplings where the connected equipment is also wearing out, the space available is limited or low first cost is an important consideration. Uniflex couplings come in eleven sizes, four configurations, two materials and regular or short variations. That makes for 176 combinations before we even include the bores and key way possibilities. The "U" type either regular or short, in plain steel is the most popular type. Regular versions that are longer have a greater angular misalignment capability of 4.50 versus the 30 of the short version. When we say short and long we refer to the spring length. Hubs could be made shorter, within the rules of thumb for bore vs. hub length. Short hubs do not change the misalignment capability, but may help fit into a smaller space. Longer hubs are also possible but not often encountered. This capability for variations makes the Uniflex an ideal coupling for OEM applications. The four variations of Uniflex configurations are shaft to shaft hubs (U Type), flange to flange center (UF Type), flange to shaft hub (UFH Type), and a dropout type (RRU Type) that uses the hub and flange combination. The eleven sizes of Uniflex allow a bore range from 0.12 inches (3 mm) to 1.50 inches (38 mm). Shaft sizes in those ranges utilize set screws, pins and at the larger end keyway and set screw methods to fasten to the shaft. The coupling is always a clearance fit to the shaft. As could be deduced from the shaft attachments the torque carrying capabilities for this line of couplings fits in the low end. Torque capabilities range from 18 inch-¬pounds (2.0 N-m) to 1890 inch-pounds (213.5 N-m). That covers a 50 HP 1750 RPM motor at the high end or a ¼ HP 1750 RPM motor on the small size. Service factors, starting torque or cyclic torque would reduce those numbers to lower values. The coupling is not limited to 1750 RPM, some sizes go up to 30,000 RPM, and the biggest coupling goes up to 3,000 RPM. Based on the availability of the springs some 303 stainless steel coupling sizes are available. They might be used for sanitary applications like food processing plants. Stainless steel couplings have smaller bore limits than the plain steel. The reason is that the outer diameter of the hub must be reduced to allow for the electron beam welding. Plain steel units are soldered at an internal spigot at the hub to spring face. Bores and keyways must be machined before the hub is assembled to the spring. Therefore no RSB units are allowed. The Deltaflex is a unique coupling with great misalignment capability, low reactionary loads, and infinite life. No lubrication or maintenance is needed for the coupling. It is torsionally stiff has no backlash and is easily aligned. The coupling has two flex planes each of which uses metal links to transmit the torque while distorted by the misalignment. The couplings angular flexibility in each of two flex planes provides the misalignment capability. If axial movement is induced the angular flexibility is reduced and the torque carrying capability is reduced also. There are five sizes of Deltaflex and two versions of each size. One is the HT or high torque version, the other is suitable for less torque. Misalignment capability is the same for either one. Configurations include the short coupled, spacer and floating shaft. The short coupled version has variations where one or both of the delta hubs can be mounted internally to change the overall length. The delta flanges are identified as inner or outer, with one of each required making a complete coupling with two flex planes. It is possible to make a single flex plane delta coupling. Deltaflex couplings can be made with round hubs. That option is necessary with stainless steel couplings. The round hub cannot be mounted internally. Round hubs provide more bore diameter capability than delta hubs. Bore capabilities run from .44 inches (12 mm) to 5.0 inches (132 mm) depending on the coupling size and the hub type. Spacer couplings of the Deltaflex line are less than 18" in spacer length and the spacers are limited to certain sizes. Floating shaft type Deltaflex couplings can be made to almost any increment of length that is less than the maximum. Maximum lengths of Deltaflex floating shafts are a function of lateral critical speed and balance of the floating shaft piece. Floating shaft couplings are made to order. The spacer and floating shaft couplings use a spacer flange rather than the inner and outer used by the close coupled version. Deltaflex couplings have two published torque ratings a maximum continuous and a peak overload torque. Peak overload is 50% above operating torque. Torque loads from 1125 inch-pounds (127 Nm) to 49,500 inch pounds (5,593 Nm) can be accommodated depending on the size and type. Normal operating torque of the system must not exceed the maximum continuous torque with the proper service factors. That will allow the coupling to have infinite life. Loads that exceed the maximum allowable will cause damage to the coupling. Start-up loads or transients or shut down loads that are less than the maximum are okay for the coupling, but could result in an eventual fatigue failure of the links. Heavy reversing loads are not recommended. Deltaflex couplings work best when subjected to steady loads with little or no fluctuation and transitory torques. Centrifugal pumps are a good application. Positioning devices with little torque load are also good applications. The triple-wound spring Uniflex and the three link Deltaflex couplings serve unique markets for all metal couplings. Both are capable of large angular misalignment, both are infinite life couplings. Each has its own features such as limited or no backlash and limited or no windup. The couplings are sold as standard catalog items from the price book. Features are available as are variations to the configuration that makes the coupling valuable to the OEM customer. If interested in learning more please visit Lovejoy's Uniflex or Deltaflex product pages.